This radar image of the surface of Saturn's moon Titan was acquired on October 26, 2004, when the Cassini spacecraft flew approximately 1,600 kilometers (994 miles) above the surface and acquired radar data for the first time. Brighter areas may correspond to rougher terrains and darker areas are thought to be smoother. The first radar images of Saturn's moon Titan show a very complex geological surface that may be relatively young. Previously, Titan's surface was hidden behind a veil of thick haze. 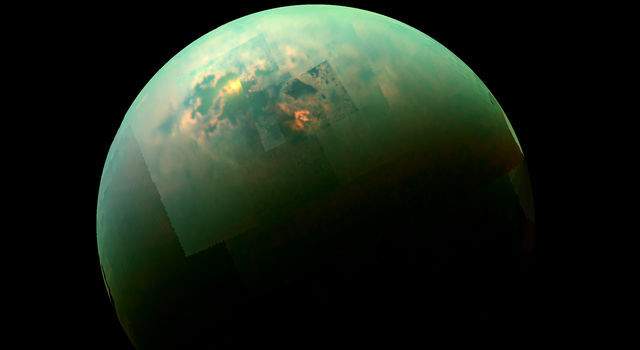 "Unveiling Titan is like reading a mystery novel," said Dr. Charles Elachi, director of NASA's Jet Propulsion Laboratory, Pasadena, Calif., and team leader for the radar instrument on Cassini. "Each time you flip the page you learn something new, but you don't know the whole story until you've read the whole book. The story of Titan is unfolding right before our eyes, and what we are seeing is intriguing." The Oct. 26 flyby marked the first time Cassini's imaging radar was used to observe Titan. 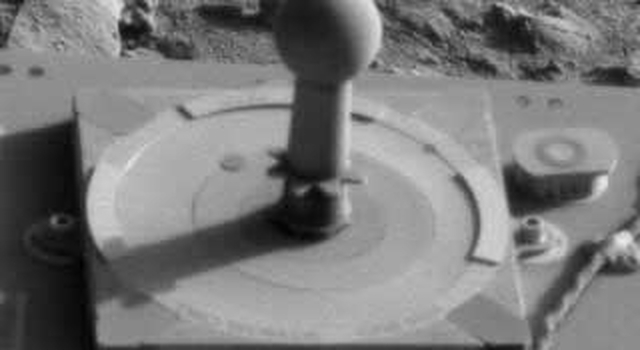 The radar instrument works by bouncing radio signals off Titan's surface and timing their return. This is similar to timing the returning echo of your voice across a canyon to tell how wide the canyon is. Radio waves can penetrate the thick veil of haze surrounding Titan. Approximately 1 percent of Titan's surface was mapped during the Oct. 26 flyby. Radar images from Titan's northern hemisphere, a region that has not yet been imaged optically, show great detail and features down to 300 meters (984 feet) across. A wide variety of geologic terrain types can be seen. There are bright areas that correspond to rougher terrains and darker areas that are thought to be smoother. "In the two days since this flyby, our understanding of Titan has grown tremendously," said Dr. Jonathan Lunine, Cassini interdisciplinary scientist, University of Arizona, Tucson. "Titan is a dynamic place with complex geologic processes that may be shaping its surface. Its surface may well be covered with organic materials, but we still don't know how much of the surface is liquid or solid. The fact that we have seen few craters tells us that Titan’s surface is young." The radar images show a world brimming with features that are dark and white, indicating sharp contrast. One area dubbed "Si- Si" or the "Halloween cat" because it is shaped like a cat's head is very dark and relatively smooth. That leads scientists to speculate that it might be a lake of some sort, but they caution that it is too soon to know for sure. "With the radar in its active mode, it is like shouting at Titan and listening for the echoes," said Dr. Ralph Lorenz, Cassini radar team member, University of Arizona, Tucson. "But we can also just listen with the sensitive radar receiver, the radiometry. The radiometry data shows early indications of the composition of the surface materials. 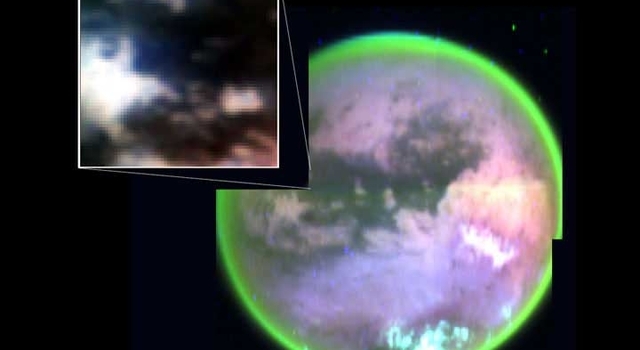 One interpretation of what it is telling us is that Titan is a place covered with organics." The optical imaging cameras on Cassini show streaks on the surface. The streaking may be caused by movement of a material over the surface by wind, flowing hydrocarbon liquids, or a moving ice sheet like a glacier. Imaging scientists are also seeing multiple haze layers in Titan's atmosphere that extend some 500 kilometers (310 miles) above the surface. At the surface Titan's atmosphere is about four times denser than Earth's. With a remarkable flyby and complicated set of spacecraft gymnastics, Cassini will try its luck with Titan again on Dec. 13, 2004. The European Space Agency's Huygens probe will detach from Cassini on Christmas Eve and descend through Titan's dense atmosphere on Jan. 14, 2005. "It's as if we were building a puzzle without the top of the box," said Lunine. "It will be necessary to piece together the clues provided by Cassini and Huygens over the next few years. Sometimes we'll be wrong and we'll need to take the pieces apart and reassemble them again until finally, a complete picture of the nature and evolution of Titan pops into view," said Lunine. More information on the Cassini-Huygens mission is available at http://saturn.jpl.nasa.gov and http://www.nasa.gov/cassini. The Cassini-Huygens mission is a cooperative project of NASA, the European Space Agency and the Italian Space Agency. 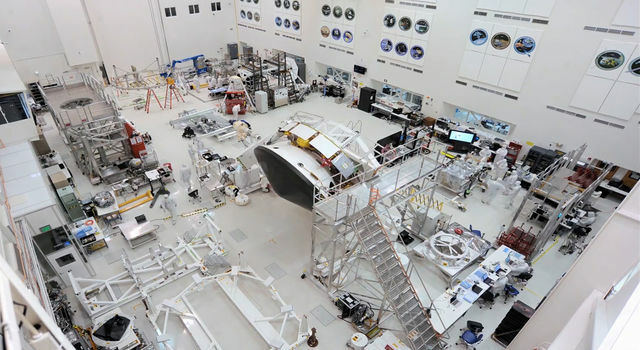 The Jet Propulsion Laboratory, a division of the California Institute of Technology in Pasadena, manages the Cassini-Huygens mission for NASA's Science Mission Directorate, Washington, D.C.